I am continuing with previews from my Thessalonians Commentary. Today I jump to the top of chapter 5 to look at what Paul has to say about the church putting too much confidence in the government. Sometimes people will ask a question which has another, larger question behind it. It’s what I call the real question. Over the years I have developed an instinct for detecting these types of questions. Maybe it’s because I can always see when a student’s question is really going in a direction other than what it first seems. My wife will sometimes use this strategy when she wants me to do something for her. She might ask “Are you going to be home Tuesday night”? Or, “What are your plans for Saturday”? I usually respond by answering her question with a cautious “yes” followed up by “why do you ask”? “What have you got up your sleeve”? Or “What is it you want me to do”? I always know that when those types of questions are being asked there is something bigger lying behind it. In 5:1-3 Paul seems to be using the same instinct. Apparently the Thessalonians have thought about everything Paul told them about the day of the Lord and decided to ask: “exactly when can we expect all of this to happen”? They are not the first to ask this, it is a perennial question. The disciples asked Jesus the same question at different times from different angles. Sometimes he answered the question, other times he did not (Matt 24:3-8; Mark 13:5-7; Acts 1:6-7). And it is not unusual to hear that question asked today. But there is a larger question behind the Thessalonians question about times and date question and Paul is able to see through it. The Thessalonians are wondering about security. They want to know for sure that they will be “fine” and don’t have anything to worry about. This is most likely why he warns them about those who are declaring “peace and security.” He could have answered their question and told them “you can’t know the day” or he could have given them some ambiguous sign posts, but instead he redirects their attention away from their desire for security to where their true hope lies. In the end, there is no security in this world other than in God and his son Jesus the Messiah. But there may be something more behind Paul’s words in 5:3 when he tells them to beware of those who claim “peace and security.” The Roman world was living in the time of the pax Romana, the peace created/enforced by Rome and the words “peace” and “security” were regularly used to promote Roman propaganda on coins and monuments. One first century historian who reflects the enthusiasm for and confidence in Roman peace and security is Velleius Paterculus when he describes the founding of Rome. It’s easy to look back at the Thessalonians and “tut, tut” them for not knowing better or for perhaps becoming too confident in the peaceful situation of the Pax Romana. But their circumstances can say much to the modern church. We live in an age that has been labeled by some as the Pax Americana, the period of peace created/enforced by the United States. Rightly or wrongly, the period since World War II has been a time in which American economic and military dominance has helped to keep the world from entering another major global conflict. With the collapse of the Soviet Union in the late 1980’s and early 1990’s the United States become the sole “super power.” It was beginning to look like the 21st century was going to be a time of peace. 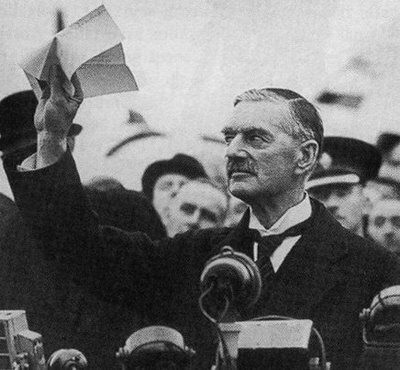 I remember how, as the new millennium dawned, pundits were celebrating the “new world order.” Then in a matter of minutes the illusion of peace, like the emperor’s new clothes, was shown to be what it really was, false security. The events of September, 11 along with subsequent attacks, conflicts and wars showed that all along we were foolish to think that Pax Americana was the guarantor of anything. The kind of peace and security the world wants can’t and won’t be found apart from God. I am away from my desk most of today, but I found this piece on Stan Porter's blog. He is talking about the challenges faced by seminaries, but he also argues why seminaries are just as important as ever. See the rest of his comments at his blog. "These are difficult times for theological education throughout North America. The current economy has not helped our financial situation. More importantly, changing demographics, including shifting views of the church and its role in our lives, have led to an increasingly negative evaluation of the importance of the church. Along with that there has been a revision of the value of theological education, whether it is at the undergraduate or graduate level. I remain thoroughly convinced, however, that the theological seminary is the only institution on the scene right now that can provide the kind of training and the kind of atmosphere necessary for developing effective Christian leaders for the church, academy, and society—there’s a reason we have this as part of our mission statement. Only in a good theological seminary can students and well-trained faculty dig deeply into Scripture, probe the intricacies of our Christian history and theological heritage, and establish sound patterns of pastoral ministry and theology." I am taking the opportunity to announce a conference that will be held October 4th and 5th. The conference is organized by my colleagues and friends in New Testament Chris Keith and Anthony Le Donne. Here are the details. Or you can go directly to the conference website. Our hope is that this meeting will provide the most comprehensive discussion to date about the limits of the traditional "criteria for authenticity" in historical Jesus research. Considering the roster assembled, we can hardly miss. 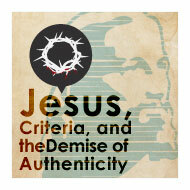 Dale Allison will reflect on his career in Jesus research and eventual disillusionment with the traditional criteria. Loren Stuckenbruck will discuss the severe shortcomings of the criterion of Semitic Influence. Jens Schroeter will discuss the philosophical problems at the roots of the "criteria approach" (a phrase coined by Chris Keith's recent ZNT essay). Chris Keith will point out the roots of the enterprise in form criticism (Chris will post more on this soon). Mark Goodacre will apply his expertise on the Synoptic Problem and Thomas to expose the problems related to "Multiple Attestation". Dagmar Winter, the foremost expert on the criterion of Dissimilarity, will share her thesis concerning "plausibility" in historiographical study. Rafael Rodriguez will argue that the criterion of Embarrassment is altogether bankrupt. I (the least of these [false modesty assumed]) will offer a modest critique of the criterion of Coherence and then throw a wrench into the whole works by suggesting that some of the traditional criteria might continue to be useful. Speaker(s): Dale C. Allison Jr.
United Theological Seminary and The University of Dayton (Dayton, OH) are co-hosting a two-day conference to critique the assumptions and methods of the so called "Third Quest of the Historical Jesus" on October 4 and 5, 2012. The conference will be held at Southpark United Methodist Church, 140 Stonemill Road, Dayton, OH 45409. Bringing together world-class authors and speakers, this conference will discuss "authenticity" and "criteria" as these concepts have been traditionally understood and employed in New Testament studies. I continue today with previews from my Thessalonians commentary. Today’s section is from 1 Thess 5:12-15 and what Paul has to say about leaders. 12 Now we ask you, brothers and sisters, to acknowledge those who work hard among you, who care for you in the Lord and who admonish you. 13 Hold them in the highest regard in love because of their work. Live in peace with each other. 14And we urge you, brothers and sisters, warn those who are idle and disruptive, encourage the disheartened, help the weak, be patient with everyone. 15 Make sure that nobody pays back wrong for wrong, but always strive to do what is good for each other and for everyone else. It is important to note that in his discussions of leadership here Paul does not address the leaders, but the community as a whole. This is the earliest of Paul’s letters and thus provides us a peek at what leadership was like in the earliest days of the church. What we find is that leadership and the community were together, not separate. There was not a focus on titles or offices, but on function. It was what someone did that identified him/her as a leader and was deserving of appreciation and respect. And both the exercise of authority and submission to it were to be done in the context of mutual recognition of Jesus as Lord and their love for one another. With that in mind we can observe the following. The first thing we can observe is that Paul puts more emphasis on the activities of leaders than he does their titles. Unlike his other letters where Paul will mention titles and even qualifications for some leaders, Paul uses his ink and parchment here to describe what it is the leaders do. This is an important point to remember in a culture that seems to hold titles in high regard. Too often people want to be “professor,” “doctor,” “vice president,” or “pastor” because they perceive a title as a status symbol that will help them move ahead. But they forget that attached to these titles is a high degree of responsibility and expectation. It doesn’t mean that titles are unimportant and should not be used. Paul used them and they help us to identify who is supposed to being doing what in the life and the ministry of the church. And that is what leaders or potential leaders need to keep in mind. It is what they do that makes the title not the other way around. In this day and age there has been a proliferation of titles in the church, many by virtue of necessity. But since we cannot turn back the clock on the modern church, we should use what Paul describes here as a “checklist” of sorts to help leaders evaluate whether they are giving the kind and level of care that leaders are privileged to give. The second thing we observe here is that the entire congregation needs to have a sense of pastoral responsibility. This means supporting the leadership both in their role as leaders and in their activity of the ministry. One way this should happen is, as Paul says, by “holding them in the highest regard in love because of their work.” It’s easy to fall into the trap of not showing respect to a leader. The political climate over the last twenty or more years in the United States has turned pillaring our national leaders into a sport. Respect for the office of the president, for instance, no matter who occupies it, has, for the most part, been lost. This same attitude can creep into the church. Rather than praying for and supporting our pastor, elders and deacons we spend our time questioning their ability, critiquing their ministry and comparing them with the pastor at the local mega church or on television. Certainly respect is something that is earned, but Paul is saying that we need to love them and hold them in high regard because of their work. This means that we don’t respect them for only how good they look or how well they speak but rather for all of the sick they visit, the late night phone calls they receive, the family vacations that are interrupted by the death of a parishioner, the couples they will counsel, the peace they will make, the friends they will bury. Paul knows from experience that the work of a leader is hard. It can be a bit easier if the people to whom they minister exhibit love and respect towards them. Those who are serving under a leader also need to remember that she or he is not just a paid employee of the church. They are also a member of the community and the one who is most often in the frontline of ministry activity. I remember when I was a youth pastor at a church we had a workday to clean the grounds and the building. At the beginning of the day one of the parishioners handed me a broom and said: “Here, I want to see my tithe at work.” I realized he was just kidding, but the comment stung a bit since it seemed to suggest that what I did in ministry wasn’t “work.” We should never presume that our tithes and offering “pay the pastor’s salary.” Granted, they do. But we don’t give to control the pastor and “get our money’s worth.” We give to support the ministry in which the pastor is the lead person who carries the most responsibility. Ministry is a community effort. It requires us all to pitch in and do what the Lord bids. But it also means supporting and loving our leaders who are there to guide us and help us along the way. They are part of us and they are over us. Finally, the role of the leader in the church is not to do all of the ministry. As Paul makes clear in 5:14-15 it is the responsibility of us all to be of assistance in the community of believers. It is not the pastor’s “problem” or “responsibility” alone. Paul encourages everyone to exhibit concern for the life of the community and at times that means encouraging people, helping them or even warning them. We need to share in all aspects of ministry, to be patient with those who are around us, and make sure that everyone is striving to do what is good for one another. Congrats to Mike Helbert! He is the winner of this week's book giveaway. 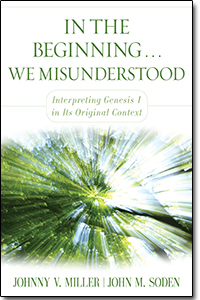 Mike has won In the Beginning We Misunderstood:Interpreting Genesis 1 in It's original Context (Kregel, 2012) written by Johnny V. Miller and John M. Soden. Mike send me your details and I will mail you the book. Remember, you have days to claim the prize. And for those of you who didn't win, I have more books to giveaway in the future so stay-tuned.